Bitcoin, along with the wider cryptocurrency market took a tumble as the Dow, S&P 500, and Nasdaq take a beating for the second day in a row. Bitcoin (BTC) 00 finally decided to make its move after the 50/50 market we’ve had for the past two weeks. The weak volume is a big indication that the market was very indecisive about which way it wanted to move, and also makes the market very high risk. Big orders can cause very big price swings. We expected a continued upward movement to the $6,700 area, but Bitcoin fell after being rejected by diagonal resistance. There are two narratives being given right now — Bitfinex insolvency issues and suspended fiat withdrawals, as well as the fact that stock market traders in Southeast Asia sold large positions of their crypto holdings to cover poor margin trading calls after we saw a massive slide off in the equities markets. While I believe part of that is true, the reality is that the volume and liquidity of the markets are as such that only 1-2 players can make the market move whichever direction they choose. The other constant we are seeing is the inability to access big margin trading exchanges during times of volatility. Bitmex was not accepting orders and people couldn’t close positions, which creates chain reactions to stop loss liquidity zones. These inefficiencies are what make the crypto markets so volatile and fast-paced. As for Bitcoin, we are seeing a few bullish indications that this may be a capitulation candle. Traders will want to watch for a confirmation of a rebound, which could take us to the $6,400 to $6,500 levels before a reversal or another drop. On the 4-hour chart, we can see that the Fibonacci levels that Bitcoinist drew out yesterday are still being well respected as we are seeing strong support at the .236 level. We are also seeing a Tweezer bottom, which is one of my favorite reversal patterns. 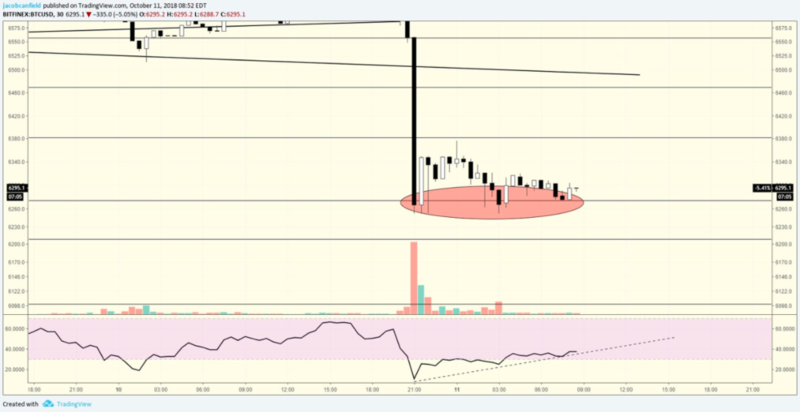 On the 30 minute chart we have a rising, bullish divergence RSI. Traders could make a ladder entry at $6,275-$6,300 with a stop loss below the tweezer bottoms at $6,240. This is possibly a safe trade with limited risk and the potential of a short-term bounce to the $6,400 to $6,500 level. If Bitcoin breaks down, traders should watch for the support level at $5,850, which is the most recent swing low. Thanks for reading and if you enjoyed the article, make sure you click the heart and leave a comment below. I’ll be sure to read them and respond to as many as I can. To get receive updates when Jacob Canfield (I Love Crypto) writes new articles, or to get in contact directly with him, you can follow him on Twitter (@ILoveCrypt0) Youtube, and TradingView. Where do you think Bitcoin price will go today? Let us know in the comments below!